So, here's the thing: I am currently trying to type this with a mashed up finger, because it turns out that when you are hammering together a shed, a nail and a finger nail are two very different things. Besides that, I am also supposed to be packing for a trip to Disneyland. But if I don't post something now, you won't hear from me for another week at least. So, despite the many obstacles, I thought I would post a short review of one of the characters from Anima Tactics. See how much I love you? Anima Tactics is a really rather lovely miniatures game. Unlike many other miniatures games, it is fought at a skirmish level with just a handful of characters. This means it is relatively inexpensive to put together a decent fighting force. I have already reviewed the game, so I am not going to talk about that again now. Suffice to say, I think the game offers a compelling mix of strategy, tactics, army building, and resource management. I don't really play this game competitively, and I just buy the characters I like the look of, and then figure out what I can do with them afterwards. Akio Kageshima is a slight exception to that rule: I didn't really like the look of the model, and I wouldn't have bought him at all; but I saw him in a sale for less than £3 delivered, and I do love a bargain. Yeah. That's right. I'm one of those people who will buy something he never really wanted, just because it got cheaper. Turns out I actually like the model a lot more than I thought I would. It isn't a particularly interesting pose or anything, but there is something about it I like. 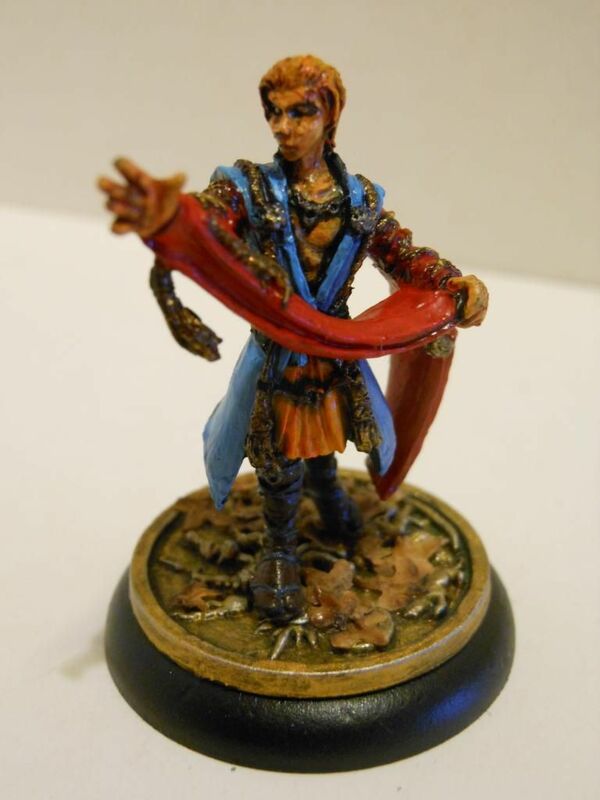 Akio is a mage character, and he looks completely different to any other mage miniature I have for any game, so that makes a refreshing change. In terms of being a usable character, he doesn't seem great. In typical wizardy fashion, he crumples under even the lightest attacks, and his combat prowess leaves a lot to be desired. In his favour, he has two ranged attacks that can strike from 16 inches out. They aren't very powerful, but you should be able to use them to wear down your opponents while your close-combat characters close in for the kill. He has a defensive action that boosts his personal defence by five, which can help to keep him alive for an additional round, and he is also cheap to add to your force, at just 35 points. 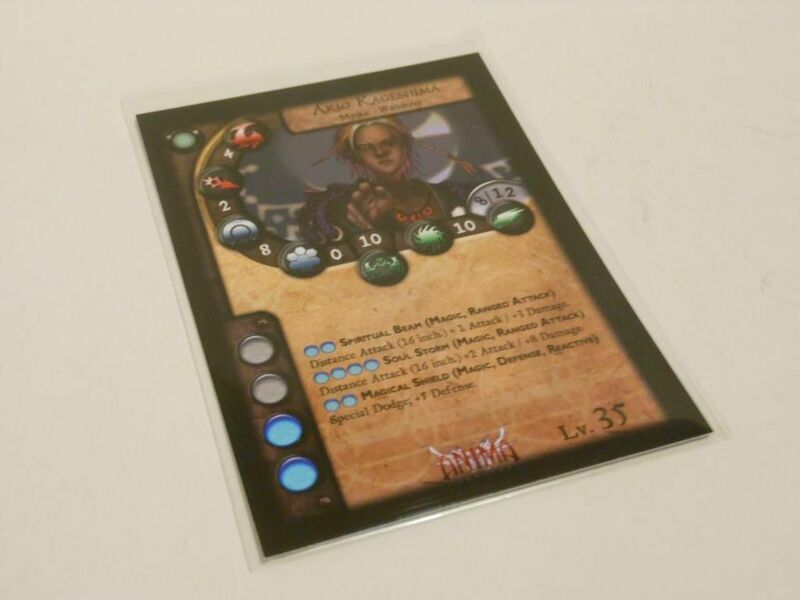 One of the nice things about Anima Tactics is that creating your force is done with cards that come with the models. You select the cards for the characters you want (meaning there are no army books). You can then select from a range of tactics cards, which you can secretly attach to your characters to give them boosts during play. This is cool, because it moves the game away from a "what you see is what you get" format, allowing you to spring surprises on your opponent. The card system also negates the need to buy lots of different miniatures. 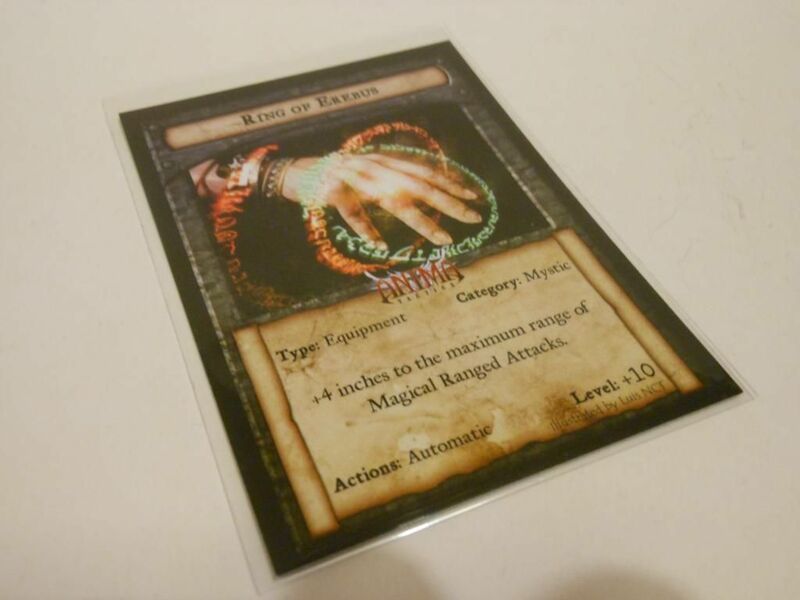 Akio ships with the Ring of Erebus item card, and this is quite a useful item to give him. It increases the range of all ranged magical attacks by 4 inches. That means Akio can strike from a whopping 20 inches away. However, considering the ring costs 10 points to equip to one of your characters, it takes Akio's total points cost up to 45, which is quite a lot for a character who can only dish out very small quantities of damage. I think Akio is a bit boring really. He tends to hang back, poking people with magic blasts. That can be a good strategy, but I tend to be a bit more gung-ho when I play. I would rather have a force composed of characters with big swords. Not that I'm trying to compensate for anything. That said, I am glad I purchased Akio. At just 35 points, and with a neutral alignment, you can easily slot him into any force if you have some points to kill, or you want to add a bit of ranged firepower to a predominantly close-combat team. Right. That's it. I've already been writing for too long. I have to get back to packing before my wife notices I'm not helping anymore. I guess 'boring' is a matter of perspective. Akio's abilities, such as being able to fire off long range magical attacks, would be more impressive if he were in a different situation - say if he was a middle manager in a large insurence office, or a primary school teacher. I had a teacher who was pretty good at firing off long-range shots. Usually with bits of chalk. He was pretty accurate, and could hit a dozing student from across the room. Interesting! And I had a Design Tech teacher who was more close combat orientated, and quite deadly with a red folder. Really there are the makings of a good team emerging here.